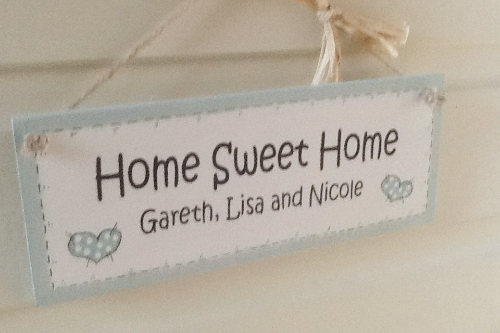 Personalised new home gift plaque handmade in a choice of colours enabling this to fit in any decor. 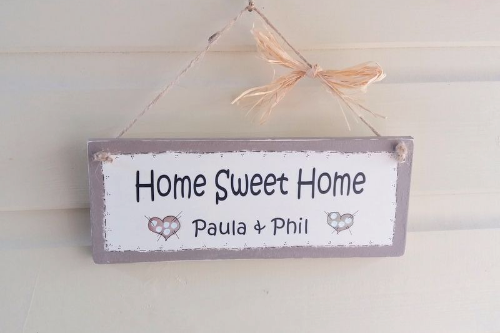 With the couples names or family names underneath and the address if required, this item is very popular with the armed forces where they are moving around and a lovely keepsake to have. Once the text has been applied it is waxed for protection and the dressings are added. The dressings can alter the design with raffia fitting with most decor or pretty bows for a more country style. A gingham tie is a bit in between and an ideal choice if unsure where the plaque will be placed, this like the raffia bow is removable and the fabric bows are not removable. Very pleased with the plaque! I've ordered with Kenzo Crafts before and always been pleased with what I've ordered. Kept up to date with the process which I find is helpful. Thank you for a great service!